UK Prime Minister Tony Blair says Iran's decision to resume its nuclear activities is likely to result in a referral to the UN Security Council. Speaking in parliament, Mr Blair said European ministers meeting in Berlin on Thursday would decide how to proceed. A US state department spokesman also said it was now "more likely than ever" that the case would be sent to the UN. But Iran's leader dismissed the threat. He said the research would go on despite the Western "fuss". Tehran says it broke the United Nations seals on the Natanz nuclear research facility on Tuesday because it wants to produce electricity, not because it is pursuing nuclear weapons. The UN nuclear watchdog, the International Atomic Energy Agency (IAEA), has said Tehran is about to start small-scale nuclear enrichment. Addressing MPs in the House of Commons, Mr Blair described the current situation as "very serious indeed". "I don't think there is any point in us hiding our deep dismay at what Iran has decided to do," he said. "When taken in conjunction with their other comments about the state of Israel they cause real and serious alarm right across the world." Russian Defence Minister Sergei Ivanov said it was a personal disappointment giving him cause for alarm. On Thursday UK Foreign Minister Jack Straw will meet French Foreign Minister Philippe Douste-Blazy, Frank-Walter Steinmeier of Germany and Javier Solana, the EU foreign policy chief to discuss the crisis. The EU talks could trigger an emergency meeting of the IAEA's board of governors which could refer the matter to the UN Security Council and lead to full-scale sanctions. But President Mahmoud Ahmadinejad said Iran would not be intimidated by "all of the fuss created by the big powers". The BBC's Frances Harrison in Tehran says that Iran's conservative president seems almost to be relishing the sense of looming confrontation - and that those who had suggested Iran was just testing the waters look set to be disappointed. Iran is banking on divisions within the international community, our correspondent says. 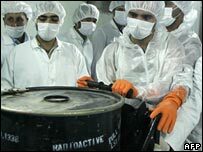 Its parliament has passed a law obliging the Iranian government to stop short notice visits of its nuclear sites by UN inspectors if it is referred to the UN Security Council.